Plantar fasciitis is one of the most common — and painful — health challenges marathon runners face. The continual pressure and stress that runners place on the plantar fascia (the flat band of tissue that runs along the bottom of the foot) can weaken the ligament and make it less able to absorb shock. Whenever the plantar fascia is repeatedly strained in this manner, damage can occur to the ligament. Swelling and irritation along the arch of the foot are typically the first signs of damage to the plantar fascia. As the condition worsens, tiny tears develop in the ligament, causing stabbing or aching pain in the heel and arch. Marathon runners and others who suffer from this foot problem generally experience their worst pain in the morning, when taking the first steps of the day. The pain level may also be more severe after sitting or standing for a long time. After taking a few steps, however, the ligament loosens and pain usually diminishes. 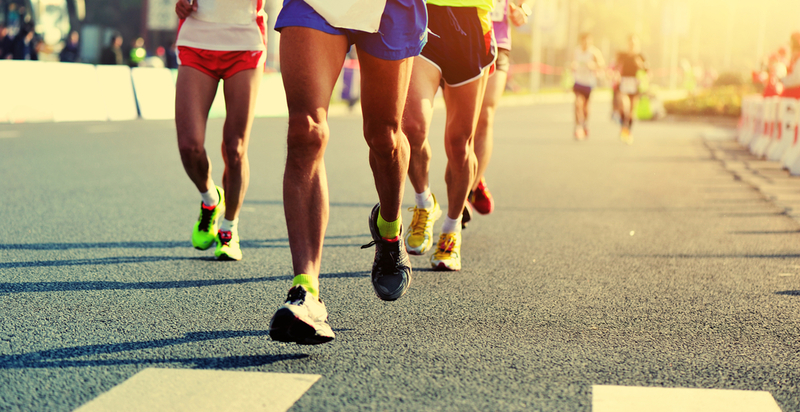 Marathon runners are particularly prone to developing damage to the plantar fascia, as running long distances can stress the ligament excessively. Runners who over-train or focus on speed work or hill training are at increased risk as well. Those who neglect to properly stretch their calf muscles are also more likely to suffer from this condition. Running on asphalt, concrete or other hard surfaces — as marathoners often do — greatly strains the ligament, potentially causing even more damage. Certain physical characteristics make some runners especially susceptible to plantar fasciitis. Having high arches or flat feet can be a contributing factor in many cases. Athletes whose feet overpronate, or roll excessively inward as they run, are also vulnerable. The same is true for those with underpronation, where the feet roll excessively outward. Weak core muscles, tight hip flexors and back problems can also play a part, as these issues can lead to changes in your stride. Does Plantar Fasciitis Mean No More Running? While it is possible to continue running after developing this condition, doing so can delay healing and cause further damage. Marathoners are generally advised to take a break from running — or at least cut down — until the area heals, which can take as long as several months. Wearing the proper running shoes to adequately support and cushion the feet is essential, and, in some cases, it can be beneficial to wear custom orthotics, such as shoe inserts or heel cups. Are you a runner who suffers from foot or heel pain? The professionals at Steward Health Care: Centers of Orthopedic & Sports Medicine in West Jordan, Utah, specialize in the treatment of athletic and orthopedic injuries. Contact us today for a comprehensive evaluation of your feet and legs to determine if plantar fasciitis may be a problem for you. This entry was posted in Foot & Ankle, News on March 22, 2016 by admin.